It's easy to accuse Justin Hines of wearing his influences on his sleeve. Over the course of his new album How We Fly (out May 14th), you get a pretty good sense of what his record collection looks like. You don't mind though, as he finds a way to put enough of himself into each song that you hardly notice that it's not groundbreaking. The record beings with a dark yet redeeming folk number in "Maybe When the Morning Comes". The song is one of several that show that Hines has the potential to be a strong storyteller in the mold of Josh Ritter. He's not that polished yet, but he's not far off. "We the People" is a fairly pedestrian number, that is until the children's choir kicks in at the end. That sets the stage for the album's title track (and standout song). It's a soulful Americana number that is powered by a harmonica and an dizzying organ. Hines seldom rocks out, but when he does the results are memorable. He's in full-on Steve Earle mode with the country-tinged stomper "Lay My Burdens Down". There's a '70s southern roots vibe on "Man On the Stand" that provides an intriguing departure. Not everything's a winner. A handful of tracks, like "If We're Wrong" and "40 Shades of Blue", are too tame to be gripping. That's a function of the intimate nature of Hines' songs. They beg to be played quietly, but with the exception of the touching "Please Stay", it's not how they are most effectively presented. With the diversity of sound it seems as though Hines was using How We Fly as a sounding board. He gives all of his influences an airing. I look for future records (and there should definitely be future records) to be more focused and cohesive stylistically. It will be interesting to hear the direction he chooses to go. 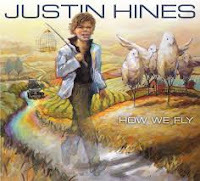 Justin Hines plays Hugh's Room in Toronto on May 22nd. Best tracks: "Lay My Burden Down", "How We Fly"